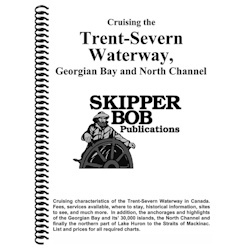 The Skipper Bob - Cruising the Trent-Severn Waterway, Georgian Bay and North Channel publication is filled with important information for cruising these areas. It includes cruising characteristics of the Trent-Severn Canal in Canada, anchorages and highlights of the Georgian Bay and its 30,000 islands. Also includes anchorages and highlights of the North Channel and the northern part of Lake Huron to the Straits of Mackinac.